December 2014 - Page 2 of 4 - Pebbles, Inc.
Hello! 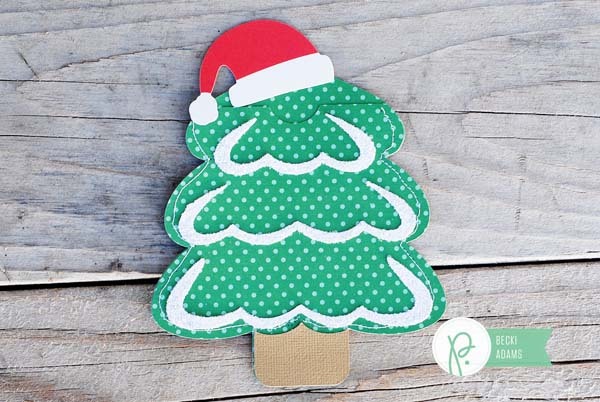 It’s Renee and I’m back with some simple handmade gifts for my girls’ teachers using the Home for Christmas collection. I made Christmas cards for their specials (art, gym, music, etc.) 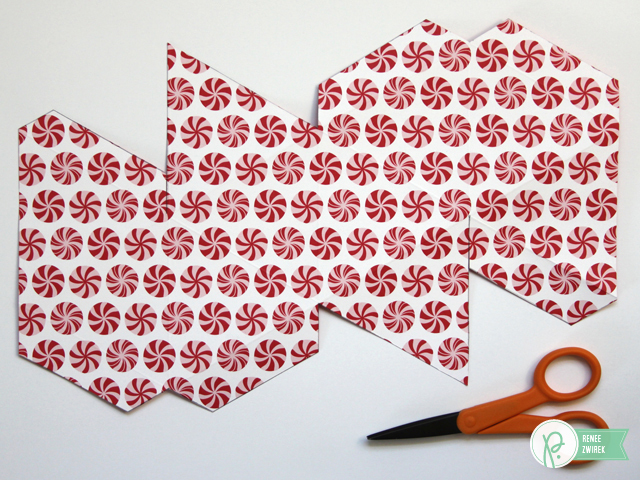 teachers and this time I’d like to share a tutorial on how I made paper gems to hold their teachers gift cards. 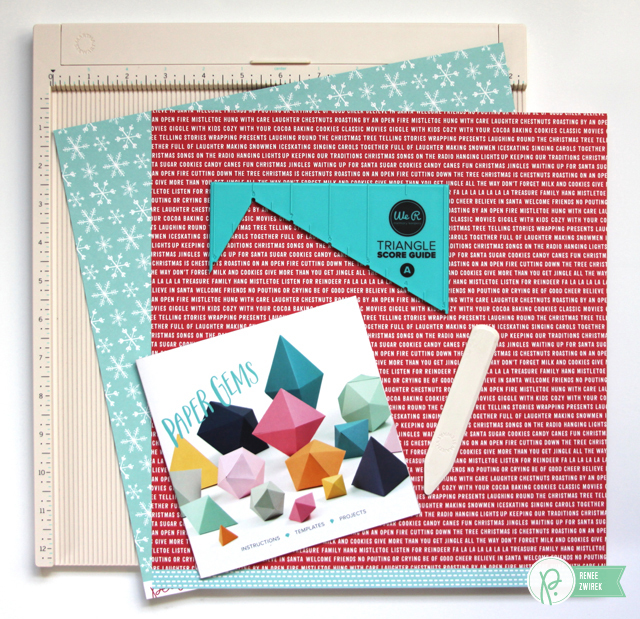 These paper gems are a unique way to present a gift and thanks to the Triangle Score Guide (with super easy to follow instruction booklet) by We R Memory Keepers they were simple and fun to make. 1. I followed the instructions to make a Decahedron (which looks like a 3-D pentagon). 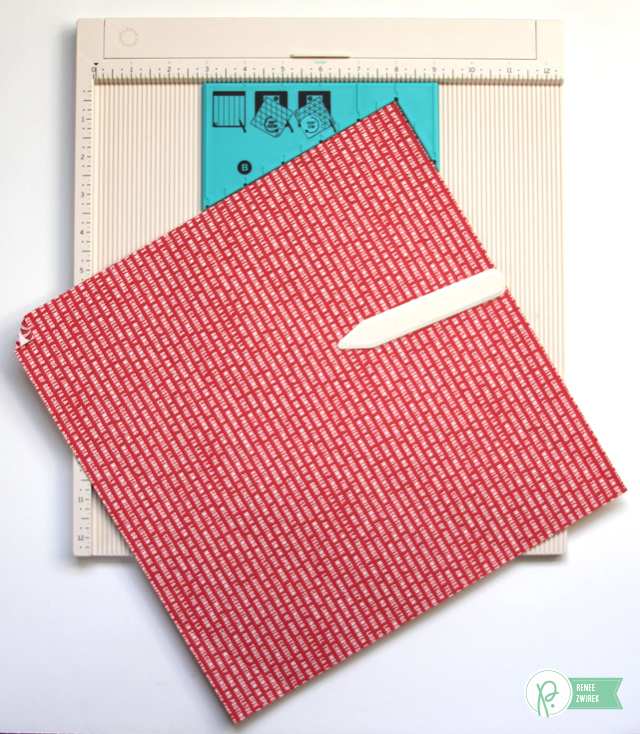 I scored the 12″ x 12″ pattern paper, Peppermint Swirl, every 3 inches. I added a tiny fold at the bottom left corner to keep track of how I will rotate my paper. 2. I rotated my paper 60 degrees counter clock wise and placed it into the Triangle Score Guide, which was placed with Side A facing up. Because I was using the Martha Stewart Scoring Board, I switched the measurements to start scoring at the 4 inch line and then scored the rest of the paper every 3 inches. 3. I rotated my paper 120 degrees clock wise and placed it into the Triangle Score Guide, which was placed with Side B facing up. 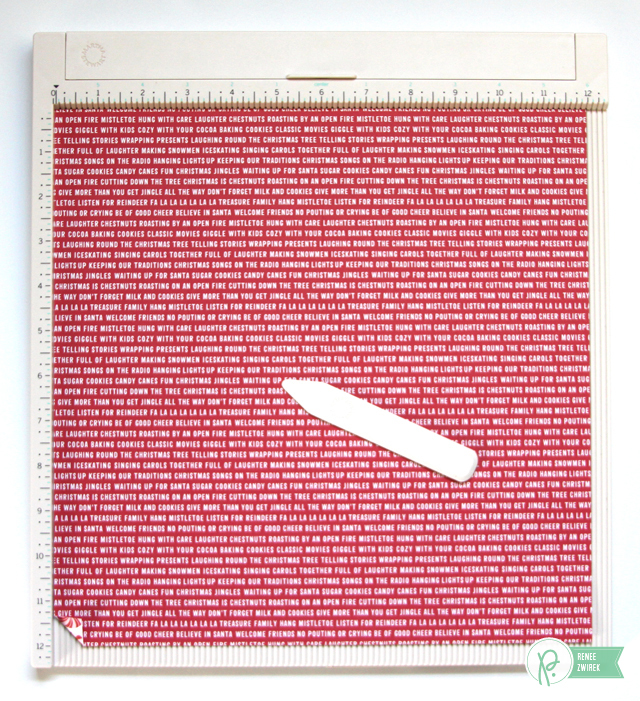 I switched the measurements to start scoring at the 8 inch line and then scored the rest of the paper every 3 inches. Here’s a close-up photo of the triangle pattern I had on the majority of the 12″ x 12″ pattern paper after all the scoring was done. 4. I flipped the paper over and followed the Decahedron Template (in the instruction booklet) to pencil in my lines. Then, I cut out my shape. I used my scissors to cut on all the pencil lines. DO NOT let this part intimidate you when you first look at the template. If I can do it…you can do it. 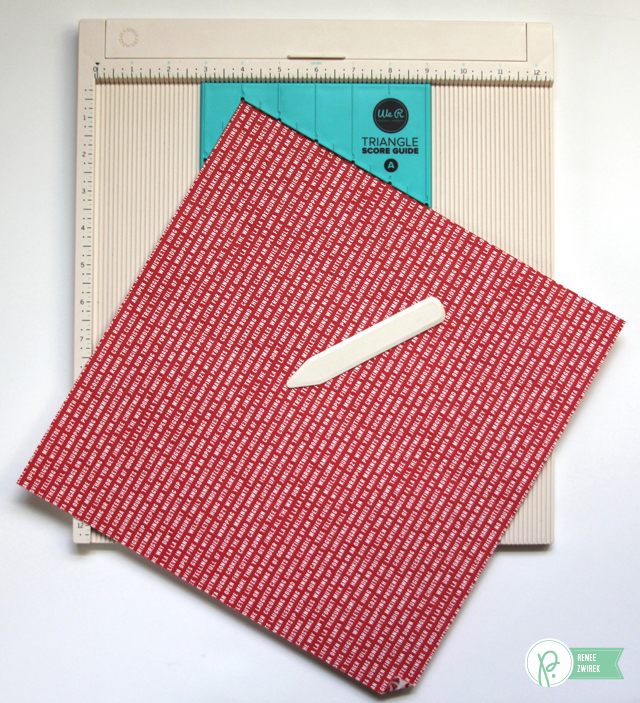 …and added adhesive to the tabs. 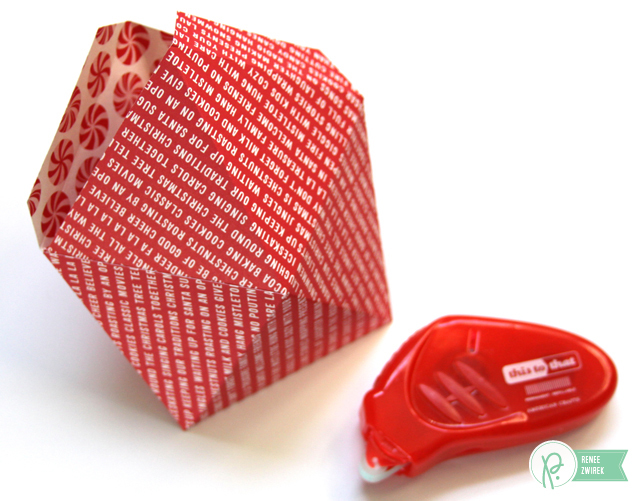 I folded the paper into the shape with the tabs on the inside and pressed the tabs firmly. You can see how cool the shape is looking here. But, wait! I had to add the fun and exciting part to it (or in it) before I closed it up. 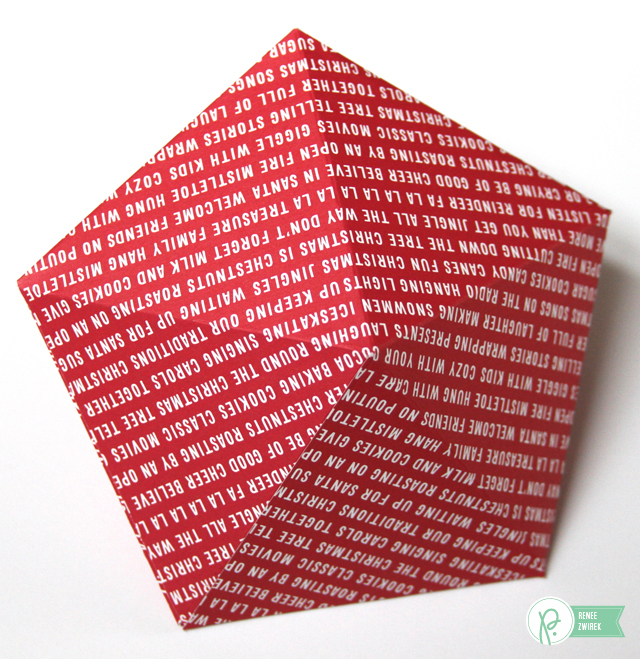 When the teachers open up their paper gems, I want it to be a fun surprise for them than just the gift card inside. 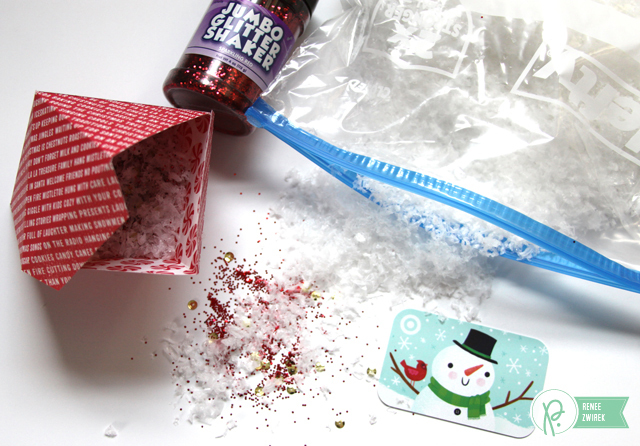 So, I added some snow, red glitter (in just this one), and sequins. 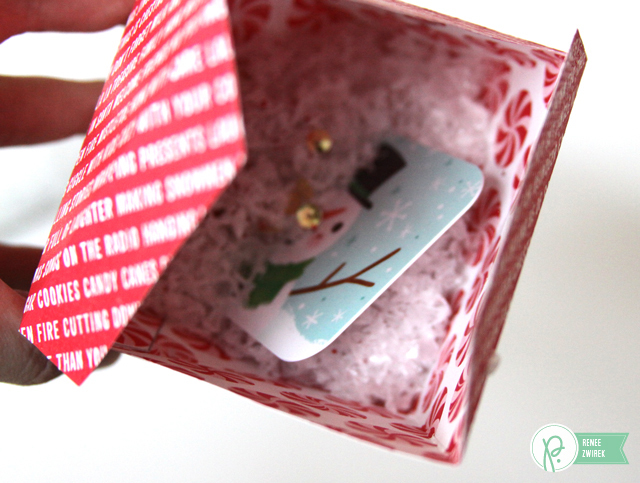 You could also add some tiny jingle bells inside and it will sound so pretty (and fun) when it’s shaken. Look how cute! I just love it! The gift card fits perfectly inside! Here’s the finished geometric shape all closed up and ready for a bit of decorations. I love this Decahedron! Adorable. 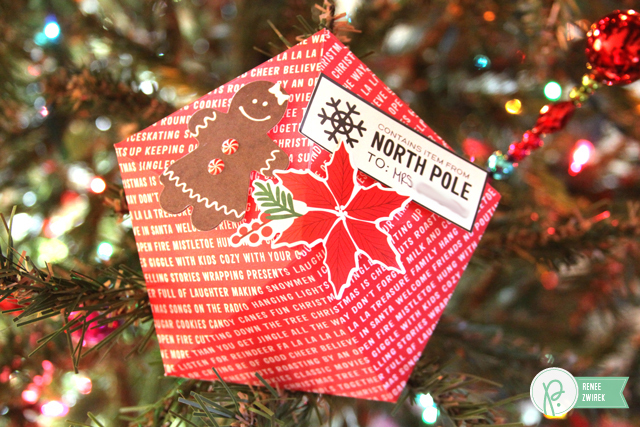 This Paper Gem Gift Card Holder is ready for Caitie’s teacher to open. 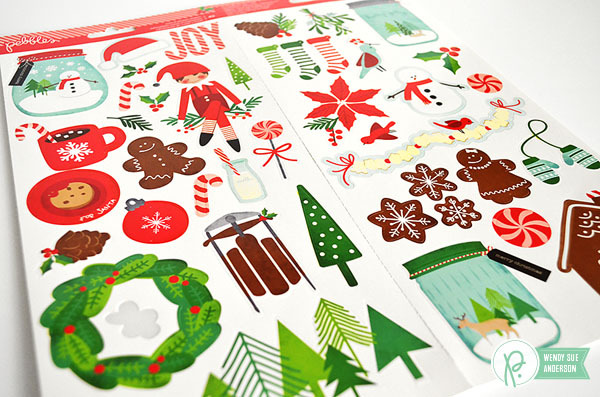 I added a poinsettia sticker, a gingerbread girl die-cut shape with candy cane dot buttons, and a cool label sticker with her name on it. 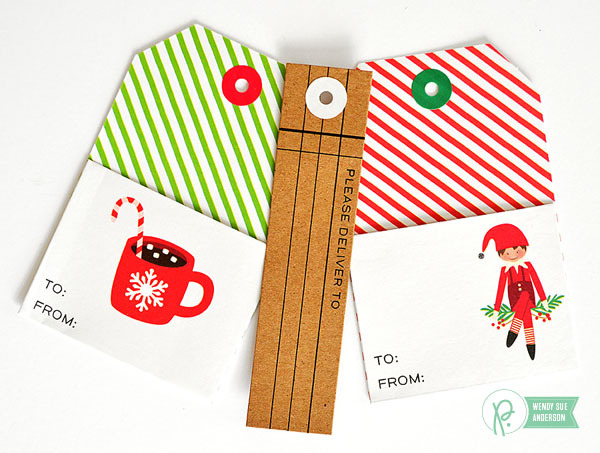 This Paper Gem Gift Card Holder is ready for Payton’s teacher. I followed the instructions and template to make a Icosahedron shape using the Snow Flurries pattern paper. 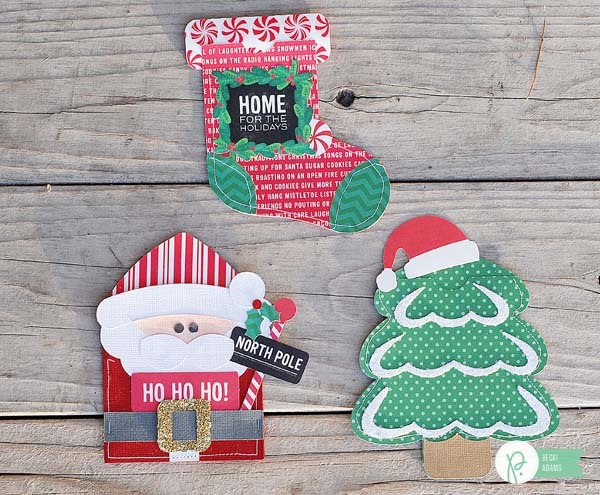 I added a pair of mittens sticker, a tree die-cut shape, and an outdoor winter themed label sticker with his name on it. Happy Holidays to you, your loved ones, and the other special gems in your life! Hello Pebbles Fans! Holly here from Ribbons & Glue sharing a simple Handmade Gift using the Pebbles Inc. Home for Christmas collection. Tic Tacs are just fun. They’ve been around forever plus they come in cute lil’ boxes. Why not promote “good breath” this holiday season and give a lil’ inexpensive handmade gift using the 1 1/2 calorie mint. 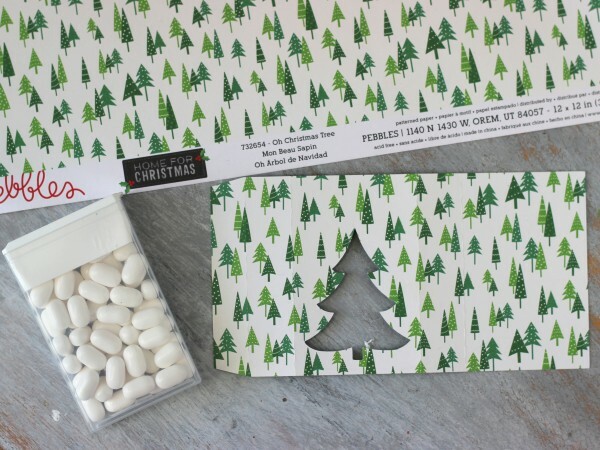 The Tic Tac boxes are made from Lori Whitlock Tic Tac Wrap cut files using various patterned papers found in the Home for Christmas collection. 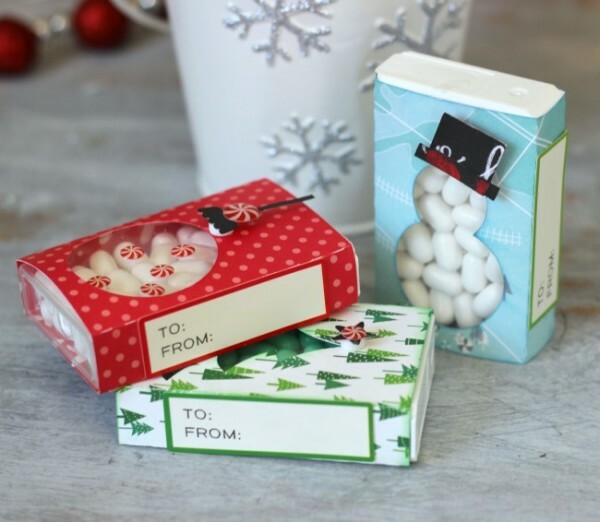 Each Tic Tac box is embellished with Pebbles Inc Candy Cane Dots and adhesive labels found in the Home for Christmas stickers. 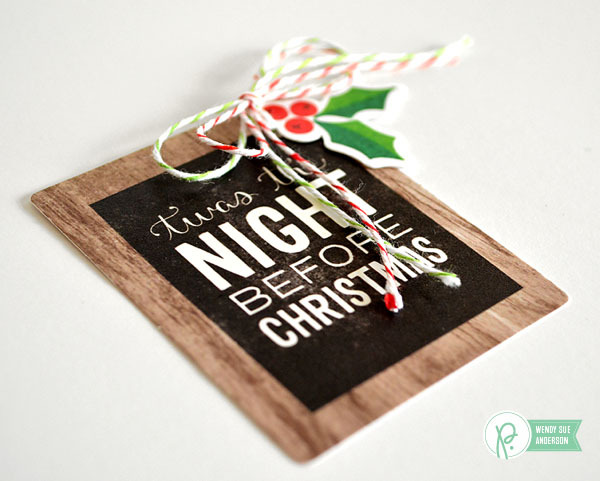 I hope this easy handmade gift idea inspires you to keep your Holiday gift giving simple. It’s the thought that counts plus fresh breath is always a plus. 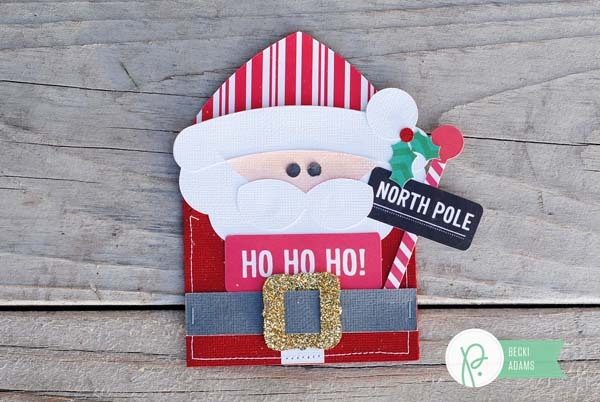 Hello, it’s Becki, here to share a set of Christmas gift card holders. 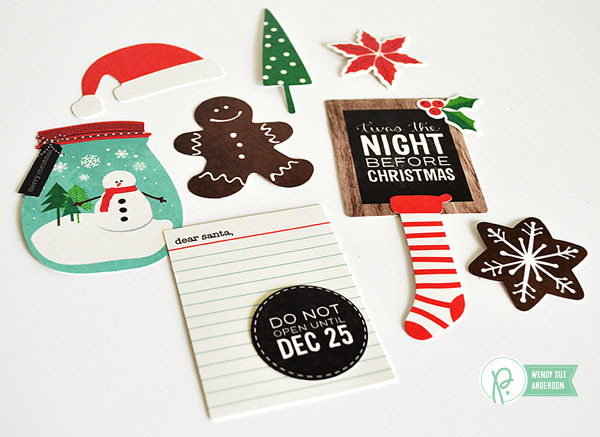 It only took me a little while to create this set using my Silhouette, some patterned paper, a little bit of cardstock, and a few die cuts from the Home for Christmas line. I thought you’d like to see how I set up my Silhouette mat for cutting out projects that I need cut from more than one piece of paper. 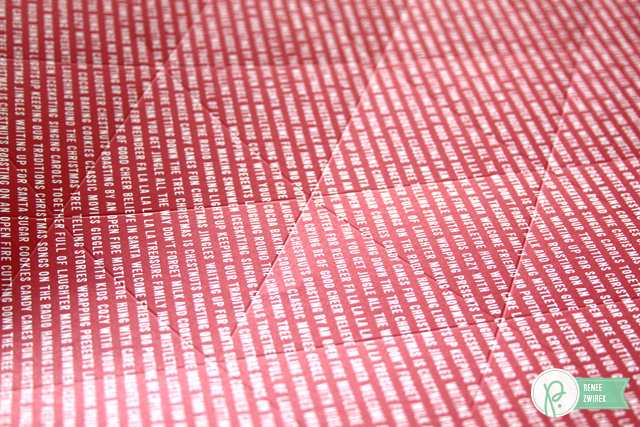 Here’s what my mat looked like as I put it in my machine to cut most of the pieces of the Santa Claus gift card holder. I cut smaller pieces of paper and put them on my mat using the grid on the mat as a guide. I placed them on the mat according to where the shapes were going to be cut. By cutting the shapes from smaller pieces of paper I didn’t have to put my cutting mat through my Silhouette as many times. Here’s the completed set of gift card holders. I’m so excited to get these filled with gift cards. 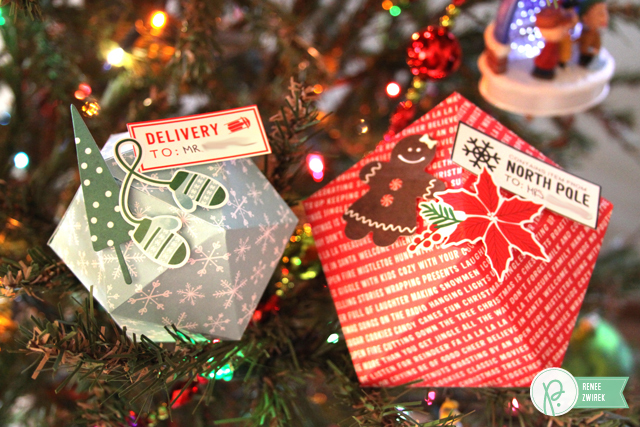 Gift cards are so easy to give and fun to receive! Happy Holidays! Thanks for visiting the Pebbles blog today! Are you ready? Christmas is only 9 days away! If you are in need of an easy last-minute gift, look no further. 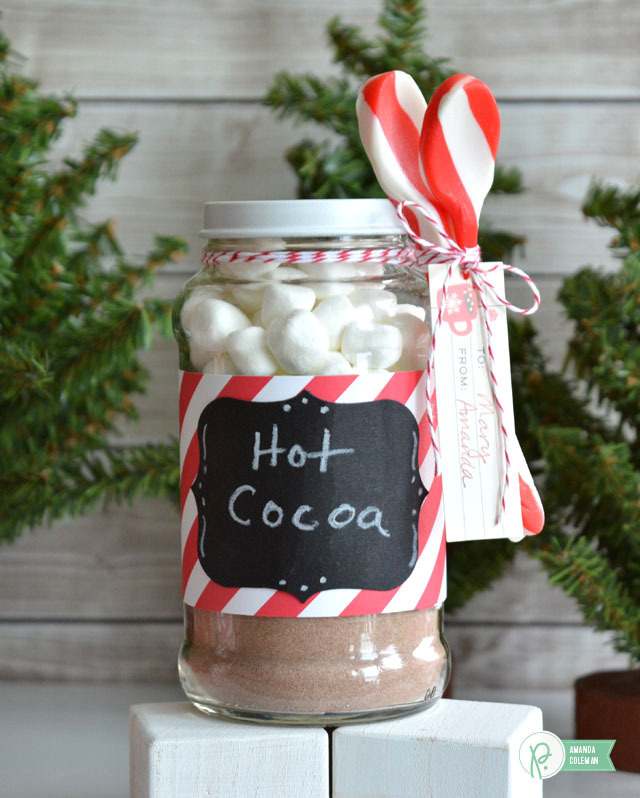 Grab a few empty jars, a piece of paper, some hot cocoa mix and get crafting. 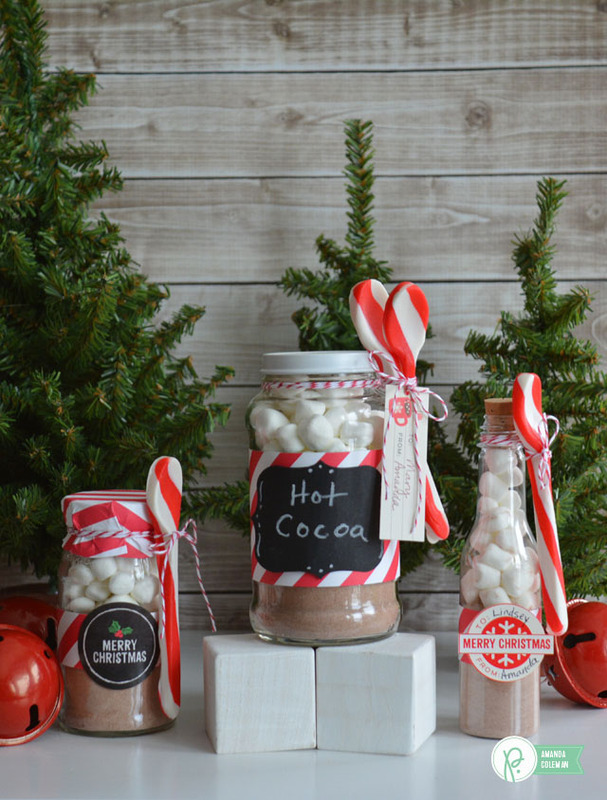 Who doesn’t love hot cocoa with mini marshmallows? It is a wintertime staple around our house. 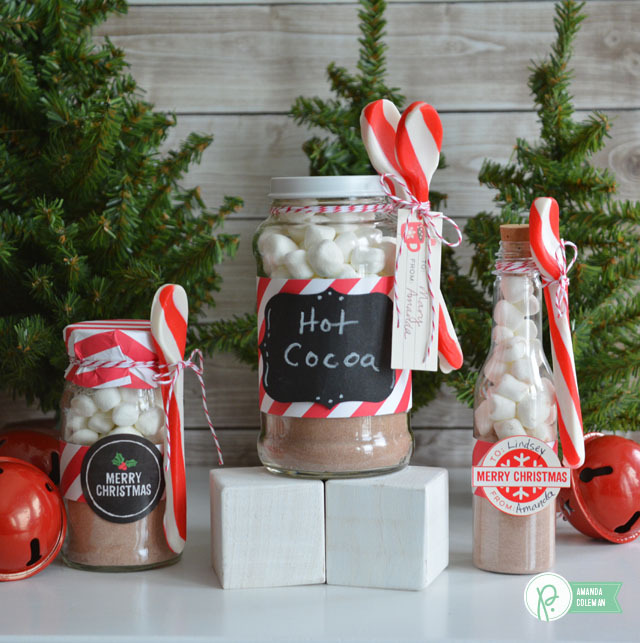 There are so many fun ways to package up hot cocoa and marshmallows, making it a fun and easy gift to give to anyone. 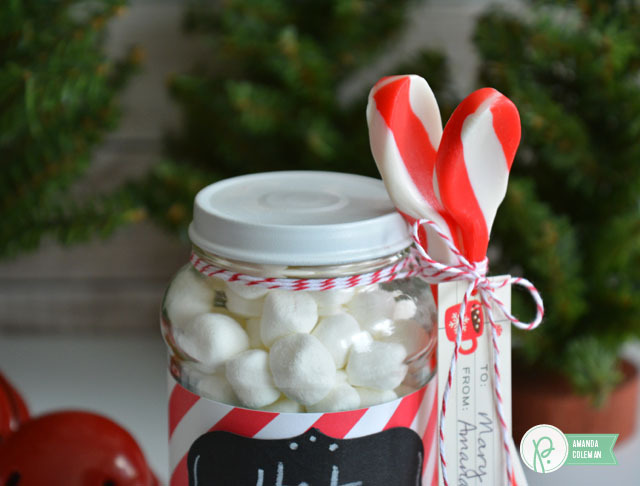 Tie on a peppermint candy spoon and it becomes perfection! Spaghetti jars are my favorite when giving treats as a gift. They are big enough so you don’t feel stingy with your treats, but small enough that filling it with goodies won’t break the bank. 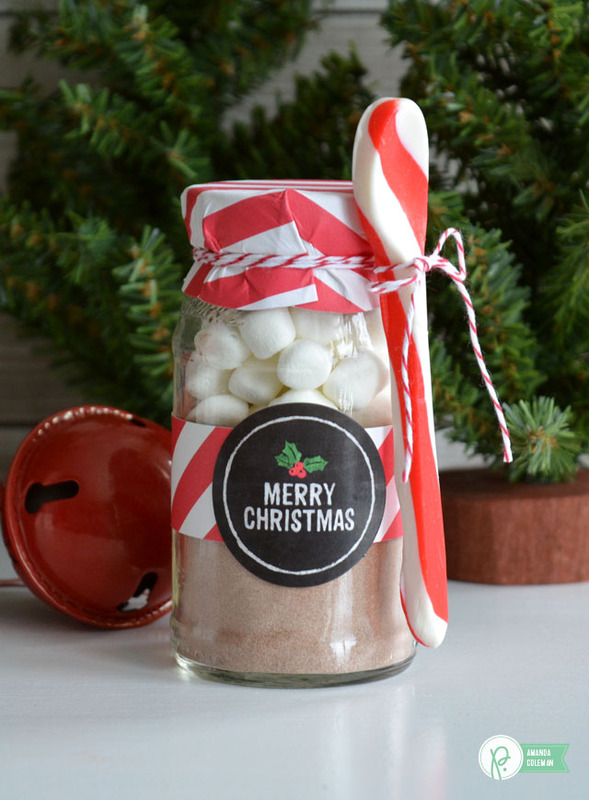 Wrap a strip of patterned paper around the jar and add a chalkboard label, then tie on a spoon, or a few, depending on who will get the gift. But, spaghetti jar lids are ugly. 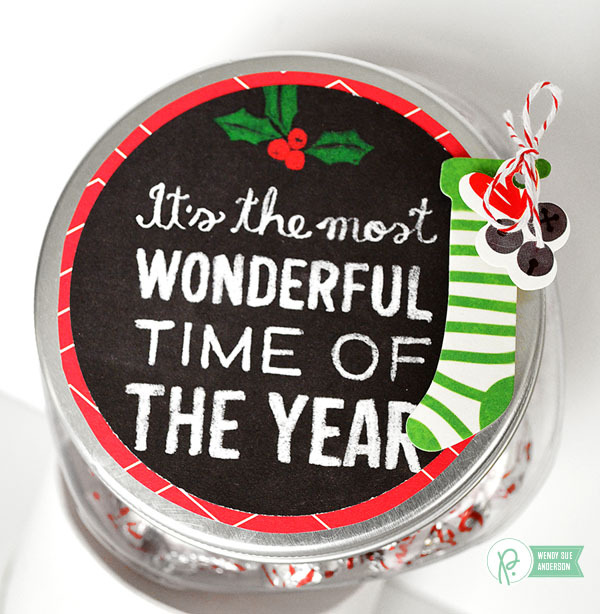 A couple coats of white spray paint easily covers the bold colors on a jar lid. Spray a bunch of lids at the same time and keep them on hand. This tall, narrow corked bottle is perfect for a gift for one. 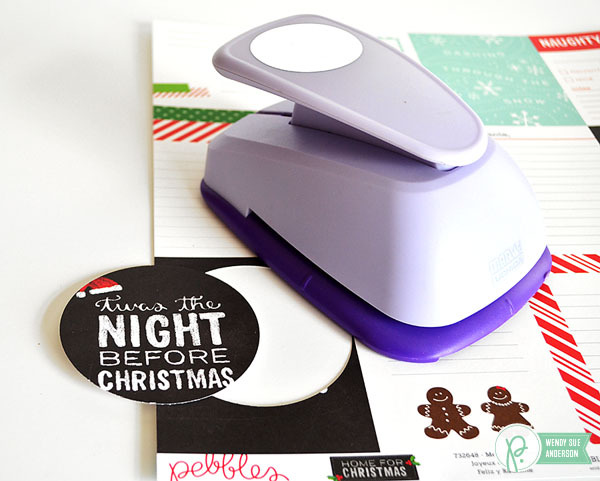 Add a cutesy label and you’re good to go. 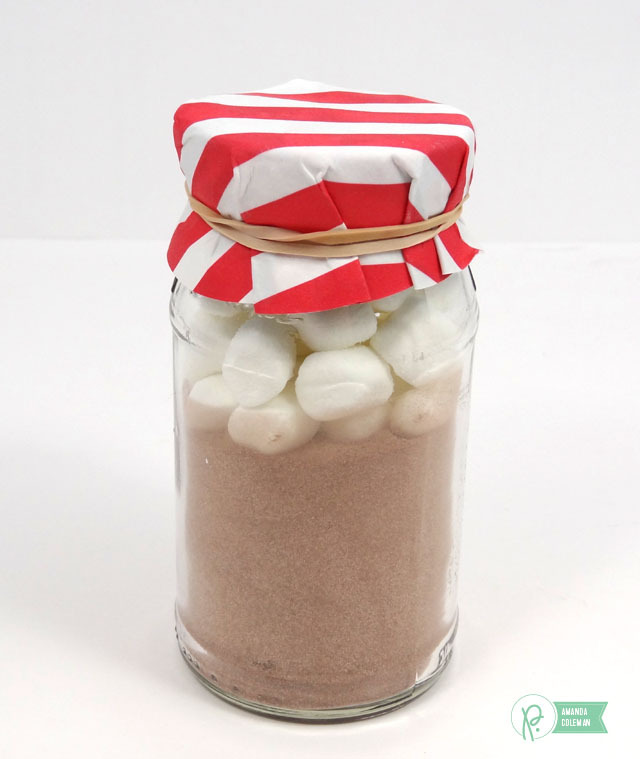 These marshmallows and cocoa are packaged in an old Smuckers jelly jar. 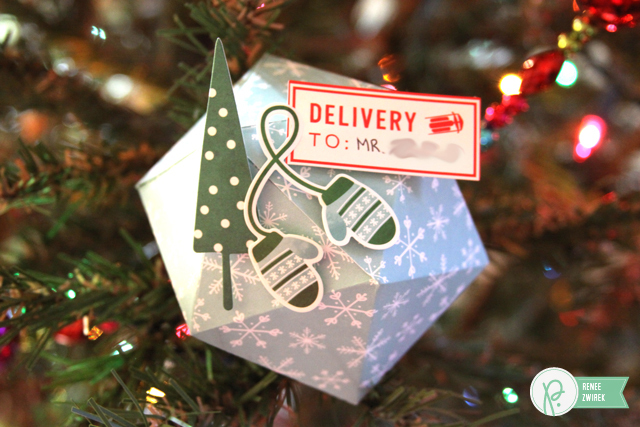 Sometimes I like to keep unlabeled gifts on hand just in case a holiday visitor pops in. 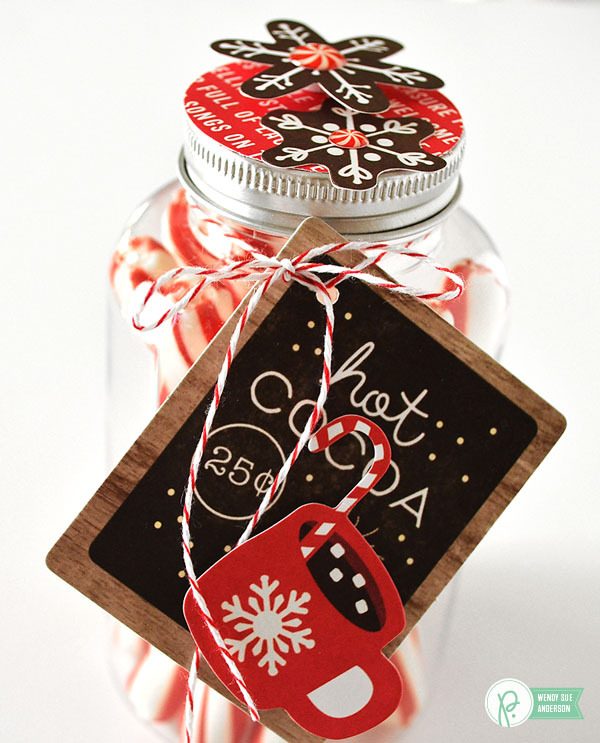 I embellished this jar with a strip of patterned paper and a chalkboard envelope seal. One quick way to cover the lid of an upcycled jar–without the mess and and hassle of paint–is to create a paper cover. 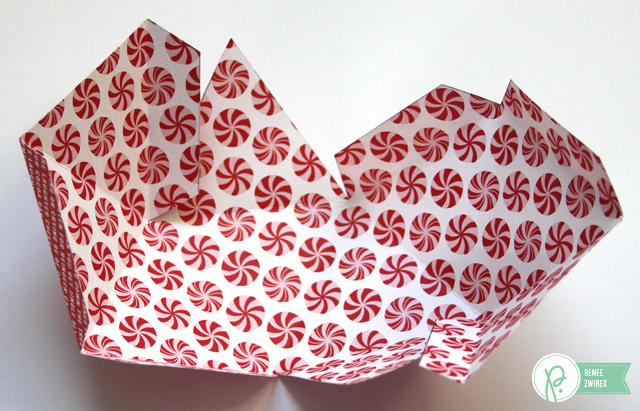 Create a lid cover by cutting a circle that is about 2.5″ wider in diameter than the lid you are covering. Spritz both sizes of the paper with water to make it more pliable. 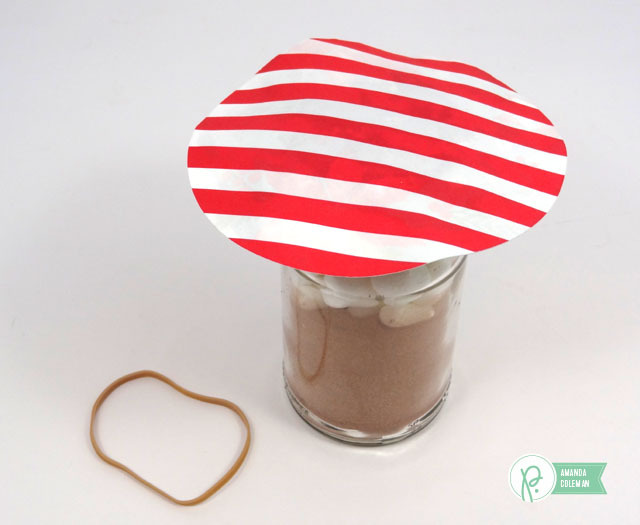 Gently fold the damp paper around the jar lid and secure with a rubber band until the paper is dry. 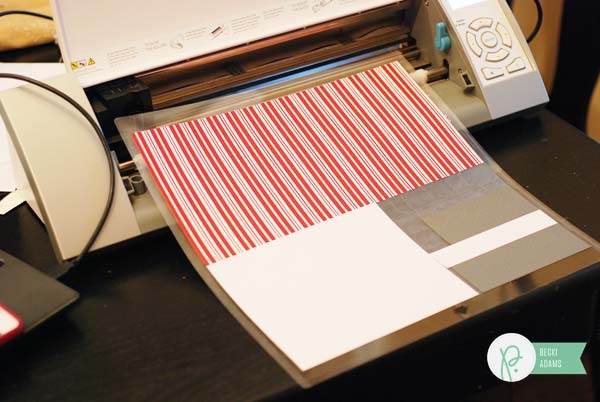 Remove the rubber band and embellish as desired after the paper is dry. Hi Pebbles Friends! 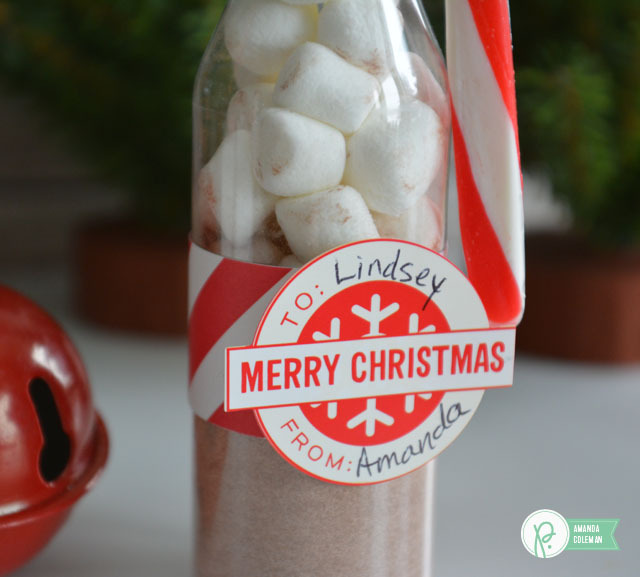 It’s Wendy Sue here today, sharing a simple holiday gift project. Seriously, this project is SUPER simple. In fact, most of it isn’t even handmade…but the final touches are handmade, which makes it special and personalized…the best of everything! 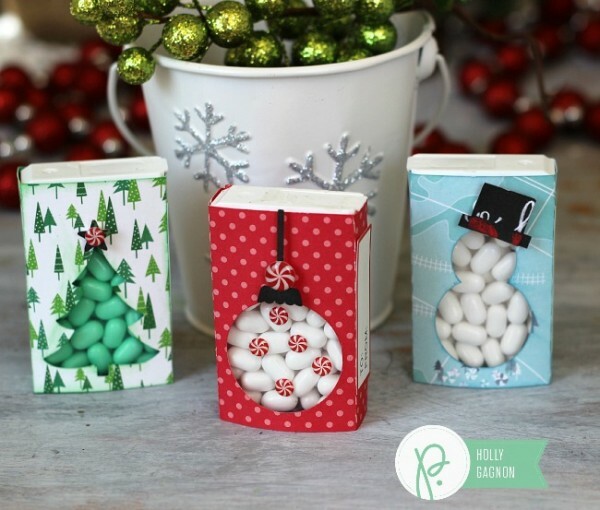 The hardest part of this project is choosing which types of candy you want to share! 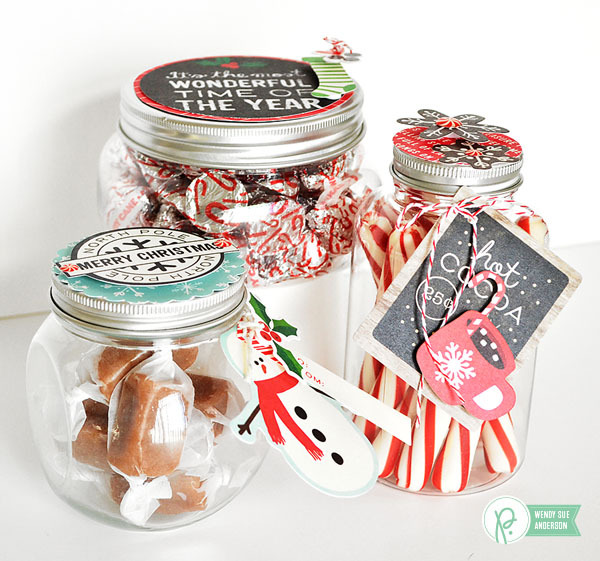 After you’ve narrowed down your candy choices, find some fun jars to hold the sweets! 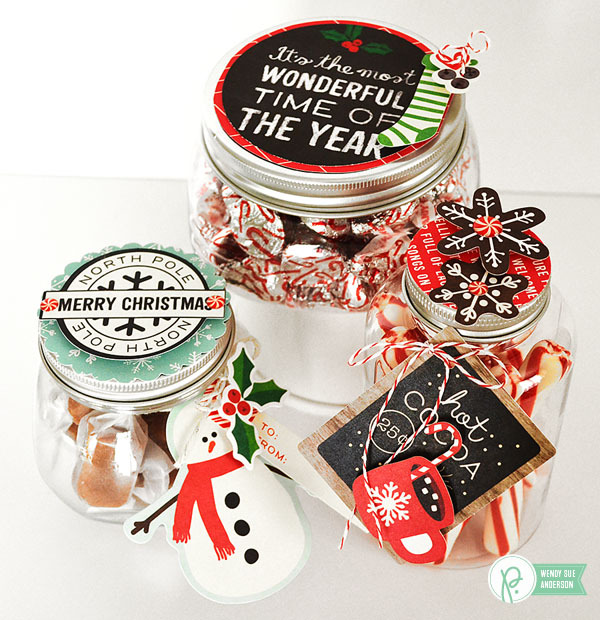 After you’ve filled the jars, it’s time for the fun to begin! 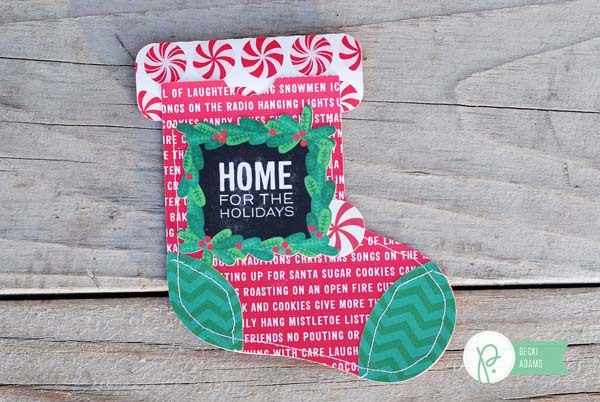 Gather your favorite holiday-themed paper goodies – I am using the Home For Christmas line – along with some circle punches and baker’s twine. Or stickers! Yes, you can use stickers! Simply sprinkle the back with a bit of baby powder to remove the stickiness and they are ready to go. 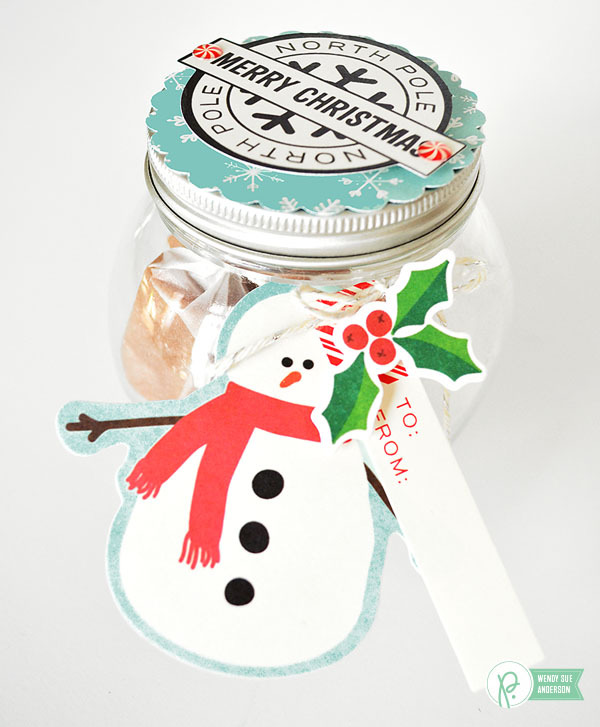 You can either stick the embellishments right on the jar lids, OR you can make tags, OR both!! 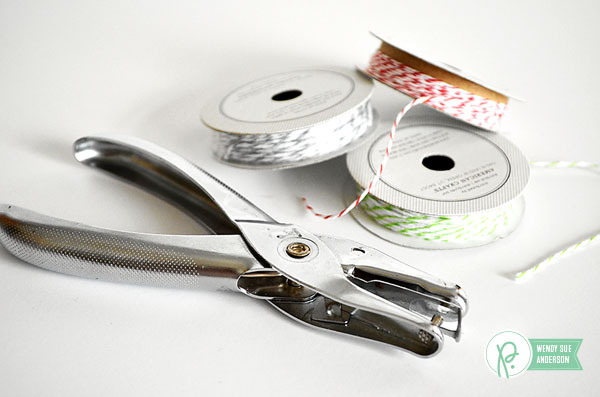 If you want to make tags, you’ll simply punch a hole in the top and tie them on with some baker’s twine. 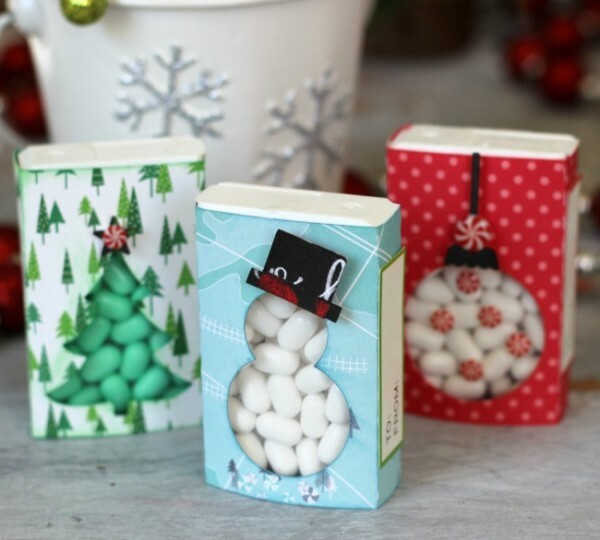 How festive are these sweet treats? 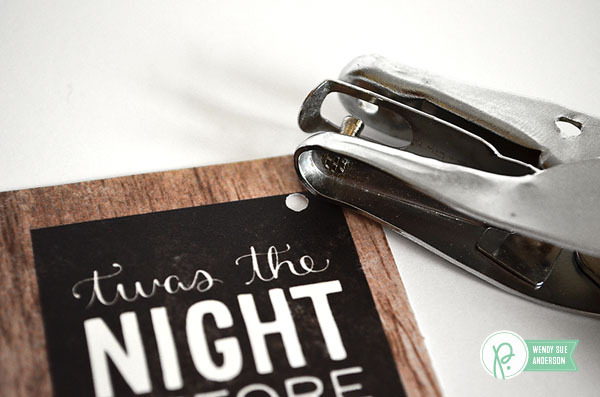 And with all of the time you’ve saved, you can go out and do some more holiday celebrating!